These burrito bowls cook under pressure for only ten minutes. The result is a one-bowl meal that’s loaded with flavor! One of my favorite things about using an electric pressure cooker is that it gives me the ability to make a “one bowl” meal in minutes. Take these burrito bowls. Combine chicken, black beans, rice, and salsa with some sautéed onions and garlic, and, after ten minutes under pressure, you’ve got yourself a tasty meal. So little work! So much reward! When using a pressure cooker, I often use boneless, skinless chicken thighs instead of boneless chicken breasts. The meat always cooks up moist and flavorful. Where, in my experience, the chicken breasts sometimes come out rubbery. Next up: Black Beans. In my opinion, black beans are the BEST beans. I love ’em so.very.much. Use low sodium or no salt added black beans. If you don’t like black beans, replace them with pinto beans. For these bowls, I like plain, ‘ol long grain white rice. You could use any white rice that you have in the house. Just don’t replace the white rice with brown rice. The cooking time for brown rice, even in a pressure cooker, is vastly different. Do you love chili powder? I LOVE chili powder! Since it’s a spice blend (usually containing dried chili powder, cumin, garlic), the flavor varies from brand to brand. I use Penzey’s Regular Chili Powder. It doesn’t add much heat but it adds a nice kick of flavor. If you want to add some heat, use Penzey’s medium or hot chili powder. Confession time: There are two types of salsa in my kitchen: cooking salsa and all the other salsas. The collection of salsa that I use for chips and as a topping on foods salsa is REALLY spicy and flavorful. It would take over a dish in 0.02 seconds flat. So I tend not to cook with it. For cooking, I want something that adds flavor but doesn’t overpower the dish. 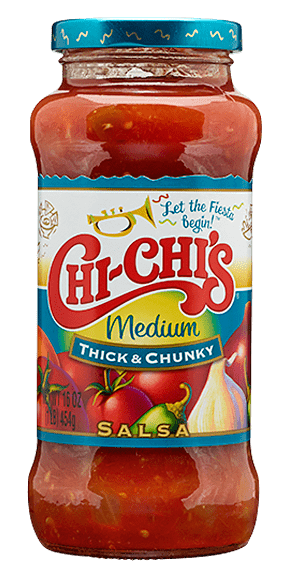 Enter: Chi-Chi’s Medium Thick and Chunky salsa. Yes. I said Chi-Chi’s. No, that’s not a typo. This salsa works really well in dishes like this one. It’s a simple blend of tomatoes, peppers, onions, and garlic. That’s it. And that’s all I want from it. Two cups or one can of chicken stock helps build and maintain the pressure needed for the pressure cooker to seal. Don’t skip this ingredient. As soon as you open the lid of the pressure cooker, this dinner is ready to eat. You don’t need to top it with anything. But what fun would that be? A sprinkle of Cheddar cheese and, if you don’t hate it, cilantro finishes the burrito bowls nicely. If I have some sour cream hanging out in my fridge, a dollop always seems to find it’s way into my bowl. And my husband always adds some pickled jalapeños and a spoonful of hot salsa to his bowl. So dress it up–or not–as much as you’d like. If you have a small portion leftover and want to get another meal out of it, cook up an egg, and plunk it onto the hot rice. This makes such a delicious dinner! Lots of folks have wondered if chicken breasts can be used in this recipe. Absolutely! Simply swap the chicken thighs for boneless breasts. You don’t need to adjust the cooking time. Set electric pressure cooker to the saute setting. Heat olive oil until it shimmers but doesn't smoke. Add the onion and cook until soft, about two minutes. Add the garlic and cook an additional minute. Add chili powder and salt. Stir to combine. Add the chicken, black beans, rice, and salsa. Stir. Pour chicken broth over the mixture. Lock the lid in place. Set a 10-minute cook time on high pressure. Once the cook time completes, quickly release the pressure. Open the lid away from your face. Stir with a wooden spoon or rubber spatula. Serve with chopped cilantro and grated cheddar. Hello, Quick question. Do I drain the liquid from the can of beans before adding them ? I do! Drain and rinse. This recipe is delicious! It works very well as written, the flavours are excellent. I used a mango salsa this round, but will try a spicier salsa next time to switch it up. I added a can of corn to it as well and that was a great addition! 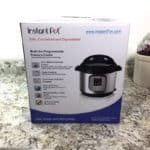 I have an Instant Pot Ultra 6qt. I made this for my husband a couple of nights back. Just before it came to pressure, I got the BURN message and rice was stuck in bottom. I’d never had thIs happen before, but read about others. I cancelled, took everything out, cleaned the pot and even added more broth. I restarted it and it did the same thing a second time. I took out and finished on stovetop. I used thick salsa. Could this have caused it? TIA. Interesting! Perhaps it is the thick salsa. I’m also wondering if the size of your Instant Pot might have also caused a problem. Would you make any adjustments if using the 6qt? Nope! This recipe was developed with the six quart IP. So you’re good to go! Can you use pre-cooked chicken? Also do you switch the rice button after you saute? No. Use the manual (or pressure) setting. I think pre-cooked chicken would taste overcooked in this recipe. I just made this with leftover chicken and it was good. Didn’t taste to cooked. Is it possible to omit the rice? Not for this recipe because then the bowls would turn out too soupy. This was very tasty! easy to prepare and done so quickly! 10 mins was perfect. Chicken was tender. We served it with extra salsa for those that like it hotter. Topped with cilantro, sour cream, and cheese. With a few tortilla chips it was a fun dinner. Thank you! Just tried this following recipe exactly. Oil heated up way too fast and burned the onion and garlic in 6qt instant pot. Then when it finally reached pressure we got the burnt message. Not impressed with this as we ended up with too much liquid, undercooked chicken and burnt rice on the bottom. I’m not sure what you meant by the “oil heated up too fast.” Sounds like your sauté setting might have been on high, not regular. Kin, thank you for putting the WW points in your reply! I am making this today and was going to add up the points. So glad to have the recipe and points! ? I’ve made this twice, and it came out perfect and delicious both times! I’m wondering about the nutritional information.. how many calories, protein, etc. per serving? I’m not sure. Best to plug the information into a nutrition calculator. Just calculated the macros. If you make it 5 servings instead of 4, it is 484 calories per serving with 4 g fat, 50 g carbs, and 62 G protein. I just opened my IP and this was the first recipe that I tried. It worked great. My super picky 14 year old liked it, so that’s a win-win any day! I served it with extra salsa, Mexican blend cheese, and sour cream. I also served soft tortillas, so we made burritos out of it. I used mild salsa because I wanted to make sure I did’t overwhelm the dish with something hotter, but I think it can take it. Next time, I’m thinking about adding in a can of green chilies. Thanks so much for a wonderful recipe. I have “pinned” it for next time! The recipe does not have garlic in it but you mention it in the instructions? Can you advise. Thanks!!! Garlic is called for in the ingredient list. You need one clove. JUSt made it. Yummmmmmmm and your Mac and cheese was a hit too!!!! FAM makes a request to keep this recipe. Made it vegan, by subbing out chicken, cheese, & black beans. So, I changed the chicken for soy curls, cheese for Chao vegan cheese, and pinto beans for the black beans. Will be making again for sure. I’ve made it in my IP 8qt multiple times with no burn notice! We love this recipe! Mine is 8 quart and I had no problem with it overcooking or burning. I don’t know that it was on high but it cooked for 18 minutes after the pressure built up. It was so delicious. I added a bag of frozen corn and a bag of frozen peas. I made this exactly as the recipe described and it was perfect !! Will definitely make it again !! When you double instant pot recipes do you need to alter times? Most of the time, no. You don’t need to alter the cooking time. Always be sure that the pot is NOT more than half full whenever you double a recipe. I just received my 8 qt Duo yesterday and was interested in trying this recipe tonight, as I have all the ingredients. Elizabeth, I see that you said you would update the recipe, as someone mentioned that it might not work in the larger pot, but I was wondering if anyone has had success in the 8 qt. already? I think I followed the directions and the result tastes great but there seems to be a lot of excess liquid. Any thoughts? It might be the chicken. Some contain added “broth.” If your chicken breasts contain broth, I’d reduce the liquid by a 1/2 cup. My go to cooking salsa is walmarts black bean and corn. Looking forward to trying this recipe. Instant Pot is a popular brand of electric pressure cookers. Could I do this in an old fashioned, on-top-of-the-stove pressure cooker instead of in an IP? Just made this tonight and it was a success. I seasoned the chicken with salt, pepper, onion powder, garlic powder, chili powder, and a little cumin. I also used mild Pace salsa since my family doesn’t like spicy food. It turned out good. I have a Farberware that is my “beginners” pressure cooker, and used the sauté function and the chicken function. Next time we’re going to try using enchilada sauce ? Mmm I love this recipe! I often make it with frozen thighs and chop them up after they are cooked. And since I hate chopping onions, I keep dehydrated chopped onions on hand and make this as a “dump” meal (I don’t saute anything). So yummy. This last time, two cups of broth made it a little smushy, but I kind of like smushy so it works for me. I have made this twice now and substituted ground beef for chicken. My husband likes it even better. Great recipe! 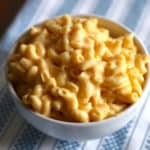 Has anyone used a 3 quart instant pot for this recipe? Do you need to sear the chicken before beginning the pressure cooking part?! Can I substitute yellow saffron rice? No. Yellow saffron rice is an instant rice and it will overcook and turn mushy under pressure. Can brown rice be substituted if the cooking time is adjusted? What would be the correct cooking time for brown rice? Since brown rice takes much longer to cook than white, the other ingredients overcook by the time the rice is done. I’m working on a brown rice recipe and hope to post it soon! Sorry I can’t be of more help right now. If you haven’t already, sign up for the newsletter and you’ll know as soon as I publish the recipe. My favorite salsa, which I use when I make chili, is Mrs. Renfro’s Smoky Roasted Salsa. 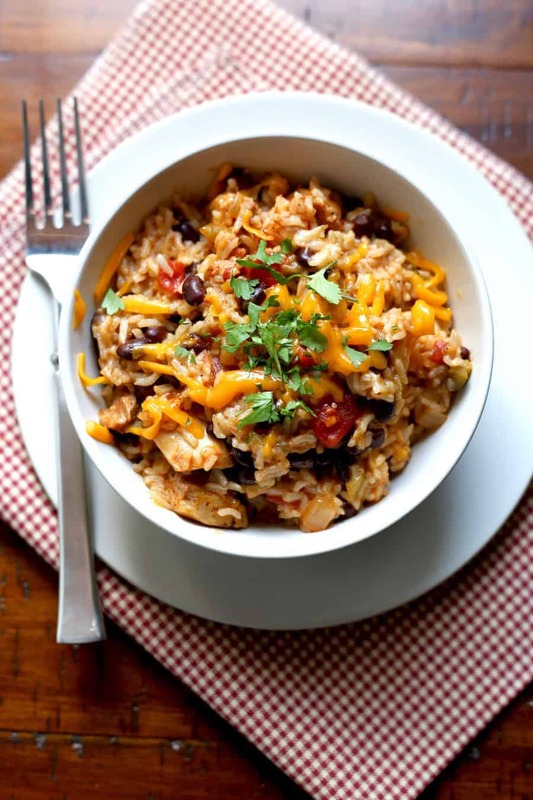 It’s medium spicy with a light smoky flavor so it wouldn’t overwhelm the burrito bowls. I need to give that a try! Say I did want to use brown rice instead of white…. do you know how long Id cook it for? Hi Jen! I’m still working on a recipe that uses brown rice. Since brown rice takes so much longer to cook than white, the other ingredients are overcooked by the time the rice is done. So I don’t recommend the swap in this recipe. We absolutely love this recipe and have made it often. 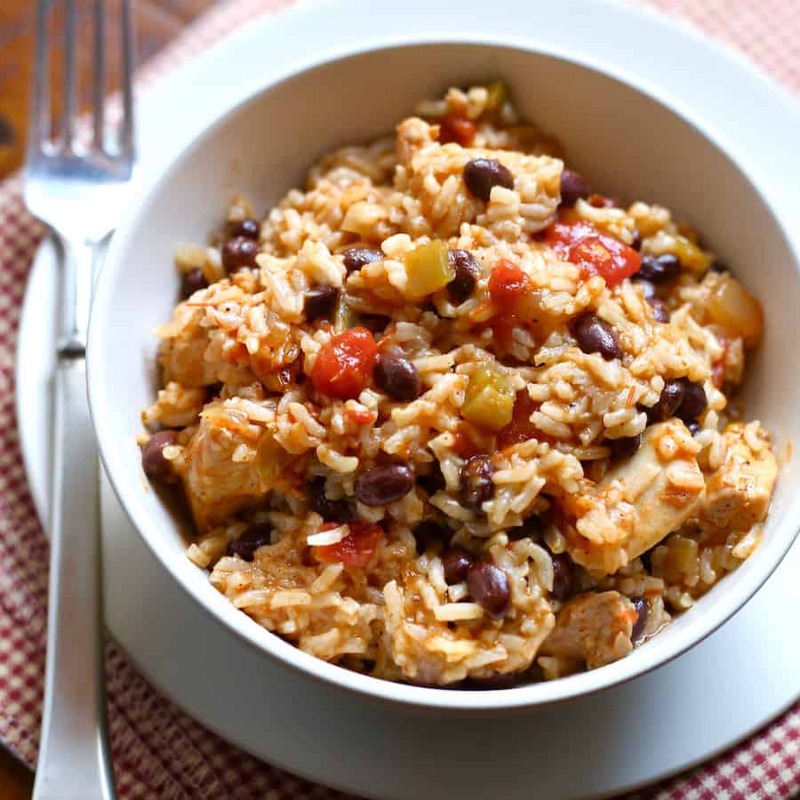 We have successfully prepared this with Rice Select Jasmati Brown Rice – we only put in a 1/2 cup. Otherwise we followed the recipe instructions. (We also added 1 t. cumin and have used fresh salsa on occasion.) It turns out great every time! Great, used chicken breast and was fine. This recipe is delicious! If you’re thinking about trying it, stop thinking and do it! The flavors are great. I used the thighs which I haven’t before and they were so tender. I did have a little bit of burned stuck rice but not enough to get a burn message. This is so good, thank you for sharing! If you use a thin salsa, the rice can get soft. You can either use a thicker salsa or reduce the amount of liquid by 1/4 cup. 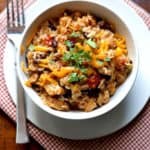 Do you think that firm tofu seasoned with salt and pepper and chopped into 1-2 inch pieces would work as a substitute for the chicken thighs in this recipe (my pot is 6 qt)? My teenager is vegetarian and I would like to try this recipe during football playoffs this Sunday. Thanks! I don’t think that would work. However, I haven’t tested it. If you use more chicken, how do you update recipe? Double chicken, double everything else? You can simply increase the amount of chicken. You don’t need to double everything else. Yes. You switch from saute to the pressure setting. If we did not want to invlude the rice, would that mess up the pressure/time? I made this for my family tonight. It was delicious. I added corn as well. The rice was plain white rice, and it was over cooked. But on the whole, it was a great meal. Is it too spicy for little kids? Also, could you add some corn prior to pressure cooking? The spice level depends on the chili powder you use. Most aren’t hot at all. 🙂 And corn would be a great addition! I would think the salsa would also affect the heat of the dish. Check it out before cooking. I made this for a week of lunches and I gotta say I’m impressed! It came out a lot more liquidy than your photos, but I almost like it better that way! I added cheese and sour cream afterwards and it reminds me of a Mexican chili! Thank you for this recipe!! How would you cooked with dried black beans? I wouldn’t. The beans would take too long to cook and the other ingredients would be overdone. Didn’t read every conversation but was wondering if anybody ever asked you about par boiling the brown rice prior to adding to the recipe? Assuming that would be what sure experimenting with. Could I use rotes tomatoes rather then salsa I canned them this summer &would like to use them? Thank you. That should work. However, if the home canned tomatoes are thin, the rice might be a little mushy. A thick salsa prevents mushy rice. Could you use frozen chicken breasts, or would you thaw them first? Yes. Frozen chicken breasts can be used. I’d increase the cook time by a few minutes if using frozen breasts. Thank you for this recipe! I made it in my 8 qt ultra and it turned out awesome! I will use a little less liquid next time, but I did use chicken breast and it came out just lovely! Do you know how this recipe would need to be adjusted if one were to swap the rice with frozen riced cauliflower? I don’t believe that would work because cauliflower won’t absorb the liquid the way rice does.